EDIT: First Fantasy support and updates (yes, there were some) on Cemetech have been discontinued until further notice. I posted this on CodeWalrus a few weeks ago, but I wanted to wait until it's more presentable before cross-posting. Here is my newest calculator project. In May 2002, I released Mana Force for the TI-83+, my first RPG to use an actual tilemap engine. In 2013, it was translated in English and that version received bug fixes and other changes. Now, in 2015, it will finally be enhanced and in color (while remaining true to the original), rebranded as First Fantasy: Mana Force! Although the original game worked on the 84+CSE (one of my only 83+ RPG that actually ran at all on that calculator), there were some display and speed issues and the lack of any color made it a bit pointless to play on a color screen. Now it is receiving the Doors CSE 8.1 treatment, thanks to the built-in Celtic and xLIBC libraries. Since this game code is a disaster, some of the optimizing will come later, although a lot of it has happened already (such as the entire map engine being replaced, saving over 3 KB and requiring much less additional RAM to run), since the primary goal of this project is to really update the game so that it takes advantage of Celtic 2 color features. Despite using xLIBC, I am sticking to full resolution mode, so implementing custom screen clearing routines and certain special effects was a bit akward and took extra space. -First TI-OS menu replaced with custom one that appears directly in the title screen. Some options removed. -Expanded the village to fill the entire home screen. -Removed many ClrHome commands and replaced them with a custom (sometimes temporary) screen erasing utility. -Mana/Item prices decreased to accomodate the lower GP increase, but it takes longer to gain enough gold to buy them. -Nut item renamed to walnut and Super mage class renamed to Wizard. -Got rid of "Welcome to village of hope", as the intro text now mentions you must save that village instead of the kingdom of the same name. -Decreased experience given per enemy to ensure next level requirement is never higher than 9999. -Decreased gold given per enemy to 10 times lower its original amount. Wow, this looks fantastic. I love the use of colors, and the fade-in on the title screen is amazing. This really shows how powerful hybrid BASIC can be! The text fading effect is the best CSE effect ive seen . Thanks. I actually had in mind to fade in the blue screen after the title screen too but I'll obviously need to temporarily switch to half-res mode, because when I tried it looked weird XD. I could maybe fade to the lighter blue shade used on the next screen afterward. The in-game menu is finally done! As you notice it's very different from the original game: Instead of a TI-OS menu (that screwed Celtic up anyway) where you select options and where you always land back, you now land straight in the item section. But here's the major difference: Now you can jump straight from one section to another using the left and right arrows! And of course, other changes occured beforehand including replacing Disp commands, removing stuff made redundant by the HUD and getting rid of Lbl and Goto's. The only sub-program that still uses Lbl and Goto's is the battle command select one. And the flickering in the village has been fixed. I am also considering replacing one of the early magic spell with Bio or Poison. It would look like Ice but green. I might also allow some enemies to use it. Another possibility was to allow 1 boss to use the energy absorb spell. There probably won't be an item nor a spell to heal poison, to add to the challenge, but it's not like poison will cause significant amounts of damage. I'll see, though. The magic animation remains the same, other than the colors. The required MP changes as well, but that's the case of every game spell anyway. Other than that, mostly bug fixes and speed improvements occurred, and I was contemplating adding elemental properties to magic spells so that unlike the original game, spells won't just be a stronger version of each others. Among the recent updates, damage formulas were replaced and potions now heal 7000 HP instead of 5000. Magic spells now have elemental properties. Each element have a set of two spells, and the weaker one is less elemental than the stronger one. Result: If an enemy is immune vs a weaker elemental spell, he'll still take half damage instead of none. On the other hand, if he's weak against that element, then the weaker spell will offer no bonus damage. Exception: Aura, which uses 4 elements and offers no bonus even though it's a tier 2 spell. 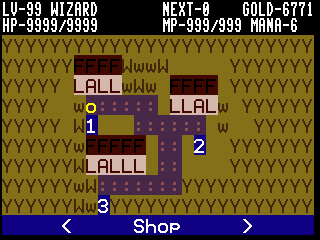 In the original game, almost every spell offered no elemental properties, causing extreme redundancy. Besides that, enemies are being nerfed/buffed as I write this, although most of this now involves changing their level. Some boss fights now requires specific strategies to be won. Boss 6 behavior was also completely replaced and he's much harder than in the original game now. Character classes were also nerfed so that the fighter class is not obsoleted the minute you obtain another: Now the first class you start with will be the only one that never miss when attacking and the four magic-based classes will cause less physical damage. In addition to that, the bargainer class has been replaced with thief. Instead of halving item prices at the shop, you will get twice as much gold in battle. You also now start the game with 20 gold. And finally, an animation at the end of every boss fight was added! -Maybe a different final boss? First Fantasy is the first RPG ever released for the TI-84 Plus C Silver Edition! Using Doors CSE 8.1 libraries to enhance TI-BASIC language, this very loose remake of Mana Force for the 83+ brings enhanced graphics, new magic spells and enemies, new cutscenes, expanded storyline and many new challenges. There are 16 magic spells available, 7 character classes, 49 monsters and several hours of gameplay. If you are a fan of Square-Enix Japanese role-playing games such as Final Fantasy, then you should try it! If you aren't convinced yet, there is an outdated video on Youtube showing the game in action, as well as the project sub-forum on CW, which has a very large screenshot thread showing the evolution of the game, and of course this Cemetech thread has the main screenshots. Enjoy the first JRPG for the TI-84 Plus C Silver Edition and my first major RPG release since 2008! EDIT: Cemetech link up, but the file was updated, so a new version will be approved soon by Cemetech mods. It mostly fixes memory issues encountered by people who have several dozens of archived files on their calc. This VAT-related issue is similar to what Gemini 3D had back then. This is clearly the best TI 84 CSE game without a single doubt. How did you manage to get all of the colors into the game? I really want to know and it would be great for the programming community if you said. I'm a Lv10 Mage that nobody can beat. Haha. Wait you managed to beat the Ruins of Darkness boss at LV 10? I doubt that one... I can barely beat 3 enemies in a row without dying as a level 60 Master! I raged after failing to beat the tower of magic when I first got to the boss, xD. I beat it the second time, and this game is definitely the best TI 84 CSE Roleplaying game so far! Good job, DJ_O! I'm slightly insane, somewhat demonic, and potentially teleporting without a helmet, but thats probably normal. Thanks . And yeah the Tower of Magic is a tough one, although I personally found the actual tower harder than the boss due to the fact we cannot use regular attacks in the tower (kinda like the Tower of Fanatics in Final Fantasy VI (or III on the Super Nintendo), so I often ran out of MP-healing items. I managed to beat the Tower of Magic today and still haven't lost. The trick is to use the Mage and then you'll only need very few MP-healing items. I have a reason for this. For those wondering, the Mage does damage with spells no matter what. So no matter how strong or weak the spell is, you can still deal damage. Not only that, but the Mage's spells are less than half as much MP-consuming as the Wizard's. The Wizard proves itself to be pretty useless, especially because you can use the Mage and the Fighter doesn't miss no matter what. Lv16 Dark Paladin that still hasn't been beaten. In the village, no matter which house Yam is on, if I press ENTER I end up in the shop. Is this supposed to happen? Also, how do I buy stuff from the ITEMS section of the shop? None of the Function keys do anything. You need to press the Up arrow to enter the shop. The 2nd, and I think the Enter button show the pause menu. You need to press the Up arrow to enter the shop. That's the exact opposite of what I'm trying to do... I end up in the shop no matter what house I'm in front of. Huh, thats weird. Are you sure that it s the shop you are entering though? Yeah I wonder why that could happen since I never had this happen myself. It almost seems like some minor corruption happened when you sent the game to your calc. Also normally ENTER brings up the in-game menu, where you see the item list by default (to heal your character and stuff). The up arrow enters the house you are in front of. © Copyright 2000-2019 Cemetech & Christopher Mitchell :: Page Execution Time: 0.420279 seconds.